The normally empty and almost hidden parking lot off Penny Road in South Barrington began filling up with cars. The SUVs, sedans, and mini-vans pulled into the gravel lot one after another. The drivers swung their car doors open and greeted one another with big smiles and hearty laughs. From the lot they will travel by foot nearly 3.5 miles through the 4,000-acre Spring Lake Forest Preserve. In the fresh autumn air they follow woodland paths, cross open fields, and walk beside Hidden Pond and Penny Road Pond. Their enthusiastic, knowledgeable and beloved guide, Carol Ruhter, had scouted this local trail beforehand. It fit her criteria for a satisfying hike. What she looks for is variation in topography, animal and plant life, and a somewhat rugged terrain. 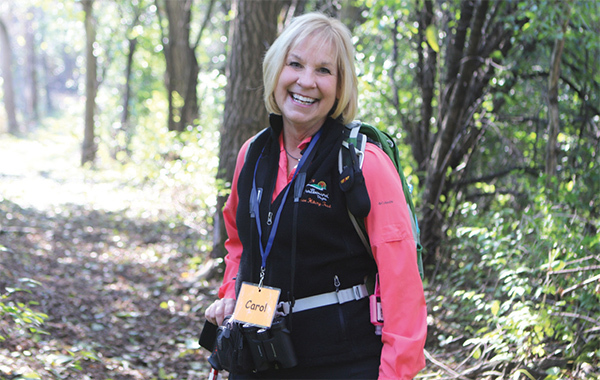 Carol ruhter is a long-time Barrington resident, wife, mother, and nature guide who founded Trailbound Trips, a hiking and biking outdoor adventure company for women. A self-described farm girl, she wasn’t always into the sisterhood. She avoided mean girls while in high school and overly competitive women while working in the corporate world. “I used to feel intimidated by women,” she said. But her desire to be outdoors and the bonds formed with like-minded women circumvented that feeling. “Outdoors we are all on equal ground. I see the spirit in women, instead of the trappings.” Ruhter has been scheduling outdoor trips near and far since 1996. In addition to day hikes, she offers short getaways and weeklong adventure trips throughout the United States. Her trips run five days a week during winter, spring, and fall. Outdoorswomen pause to capture a moment of their enduring camaraderie. She won’t cancel a hike due to rain or snow. “There is no bad weather, just the wrong clothes,” she said. For Ruhter, true freedom comes from having fun outdoors no matter the weather. When Ruhter raised her arm the women fell into line behind her. “Hey, look at the beaver chew” one of them exclaimed at seeing a gnawed tree trunk. Ruhter asked some trivia questions about the creature and explained its average weight and that they mate for life. 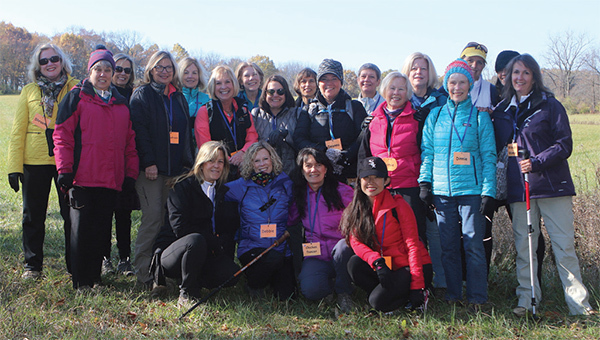 While the women who hike are varied by age, occupation, and personality, what they have in common is a joy of being outdoors and willingness to learn more about it. Many of the women have been hiking together for years. “We’ve walked many paths together and not just the ones in the woods,” Ruhter said. She’s observed that for some, the natural world brings healing and health benefits, for others it’s just fun to explore. “People connect with one another, with the land, with the self, and with God if they are so inclined,” she said. Research shows the physical benefits of hiking. There are mental health and cognitive benefits, as well. The “British Journal of Sports Medicine” reported that participants in a study on outdoor walking in a group showed significant improvements in blood pressure, resting heart rate, body fat, lung function, and mood. And something more—social connectivity, which is known to support longevity and a healthy brain, as well as lessening stress. Other studies show that being outdoors increased attention spans and creative problem solving skills by 50 percent. Each hiker had her reasons for hiking with the group. “It was the first thing I did to treat myself after retiring,” said Laura Mandell. She learned about the hiking and biking excursions from a friend. At Penny Road Pond Carol Ruhter shares information with the group and answers questions. As the hikers continued walking other stories emerged. “I love the winter hikes,” Claudia Levin said. “The air, sounds, and light are different. Hiking gets me outdoors to see the beauty.” After experiencing several losses, she said hiking with the group “saved my life”. “I have to tell you,” said hiker Deanna Moran. “I once saved an injured bullfrog using the first aid kit I travel with on these hikes.” She had pulled a fishhook out of the bullfrog’s swollen mouth and showed a picture of it smiling after the ad-hoc surgery had been performed. The paths were neither paved nor gravel, but a pressed floor of leaves, grass, or dirt that sometimes turned muddy. But the women marched on. Gold and red leaves fell silently from the trees. The sky was a canvas of blue. “Nature’s tunnel,” Ruhter said as the group entered a wooded area of tall arching trees. Ruhter’s voice fluctuated from a siren call to a childish whisper as she moved along the path identifying plants and trees. “It’s beautiful, but don’t touch that,” she warned about the wild parsnip. Its sap contains chemicals that can make skin sensitive to sunlight causing burns or blisters. Her mix of optimism and pragmatic knowledge invigorates those around her. The hikes have inspired Dinnie Dickenson to venture into other natural areas. Her favorites are Cuba Marsh, Deer Grove Forest Preserve, and walking along Spring Creek. “It’s hard to believe that we are so close to a major city. This is another world,” Dinnie said. The path opened up to a grassy field where deer were spotted trotting in the distance. Collapsed tall grasses or a single tree in a prairie may be overlooked by most, but Ruhter stopped and explained that the crushed grass were deer beds. The lone tree, a Burr Oak, most likely survived prairie and savanna fires thanks to its thick, corky, fire-resistant bark. The hikers got quiet and listened. Lisa Olszewski agreed. “I wouldn’t do this on my own. I like having a guide. This is something different and new for me, not like yoga. Why not try twirling in a field?” she said while happily joining the group that was spinning outspread arms in an open field. They looked like falling samaras, commonly known as helicopter leaves or whirlybirds. Left: Writer Mary Klest takes field notes from hiker stories on the trail. Right: Women who hike represent all age groups. At Hidden Pond pictured from left are Anne Ordway, Lisa Olszewski, Helen Cossio, Dinnie Dickenson and Vicky Tobias. The cameras came out as the hikers approached Penny Road Pond. “This is all around us,” said Lorri Stenoien. Such whisk of wonder cropped up often amongst the hikers as the vistas changed. Stenoien and Ruhter raised their kids together. She has been hiking with Trailbound Trips since 2001. Stenoien recalled how the whole thing began at the Buehler YMCA on Northwest Highway. She said Ruhter had organized a trip through her church, and then started a one-day a week local trip from the YMCA. It included hiking, biking, and canoeing. Ruhter moved it up to two days a week and went out on her own. In doing so, she was able to raise the maximum number of participants and expand the trip length and activities. Some trips include kayaking, rock hopping, and dog sledding, as well as hiking and biking. 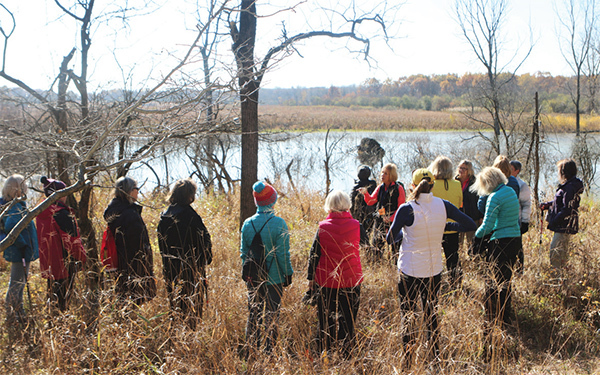 After leaving Hidden Pond, Ruhter asked for 15 minutes of silence as the women started making their way back to the starting point. During each trip, she looks for a beautiful stretch of trail to instill silence. She wants the women to listen and look and let nature speak to them. Most of their gazes turned downward toward the path. The shuffled sound of footsteps became amplified. The tone of birdcalls resonated. A pungent smell from a waning prairie wafted. A light wind wiggled and loosened crisp leaves. These were the gifts of a quiet mind. Ruhter likes the Barrington area and admires it. “Barrington understands conservation. We can be so thankful to live in an area that addresses the need for green space, for the health of our spirits, our bodies, and our earth,” she said. She quoted naturalist John Muir: “Everybody needs beauty...places to play in and pray in where nature may heal and cheer and give strength to the body and soul alike.” Nature is her cathedral, she said. Just as in life, there are different paths for different seasons and different reasons. Here are some of Trailbound Trips founder and guide Carol Ruhter’s favorite hikes and excursions in the Midwest. Winter: Rock hop across frozen springs at Starved Rock State Park. Explore under and behind frozen 90-foot tall waterfalls. It will take your breath away. Go dogsledding in Michigan’s Upper Peninsula. Mush your own team of dogs. Cross country ski and snowshoe in the Northwoods. Spring: Wander amongst the wildflowers at Bluff Spring Fen in Elgin before the trees leaf out. / Hike along the Rock River at White Pines State Park near Oregon, Ill., and watch the wildflowers bloom. Summer: Bicycle on the paths at Cuba Marsh in Barrington to feel the breeze and keep cool. / Kayak, sail, and stroll the Apostle Islands in Lake Superior off Wisconsin’s North Coast. / Wild Women Triathlon in June at Busse Woods in Elk Grove Village is sponsored by Trailbound Trips. It includes a 12-mile bike ride, a walk or run for 3.1 miles, and kayaking 1.5 miles. Fall: Take in the tall grass prairie at Crabtree Nature Preserve in Barrington. / Follow the animal paths at Deer Grove Forest Preserve in Palatine. / Hike through sandstone canyons and along the banks of Sugar Creek at Turkey Run State Park in Marshall, Indiana. Year Round: Find amazing beauty year-round at Reed Turner Woodlands in Long Grove, Ill. / Go rock climbing, rappelling, or horseback riding at Devil’s Lake State Park in Baraboo, Wis.
Mary Klest is a lifestyle, business, and travel writer living in Barrington. Susan McConnell is a photographer, writer, and the founder of the nonprofit Let It Be Us. She is a Barrington resident.